DENVER, April 24, 2017 /PRNewswire/ -- DaVita Kidney Care, a division of DaVita Inc. (NYSE: DVA), a leading provider in kidney care services, today announced the launch of its "Springtime Favorites" cookbook, a delicious collection of kidney-friendly spring recipes that highlight the season's brightest flavors. The seasonal recipes introduced in this cookbook were created to be kidney-friendly with each recipe containing lower levels of sodium, potassium and phosphorus and high-quality protein to provide adequate nutrition to help dialysis patients feel their best. "We coach dialysis patients to eat foods that can help them maintain better kidney health, as diet and nutrition are critical components of managing kidney disease," said Sara Colman, RDN, CDE and manager for DaVita.com nutrition. "DaVita's kidney-friendly cookbooks are a great resource that help take the stress out of preparing delicious seasonal dishes that are also kind to your kidneys." 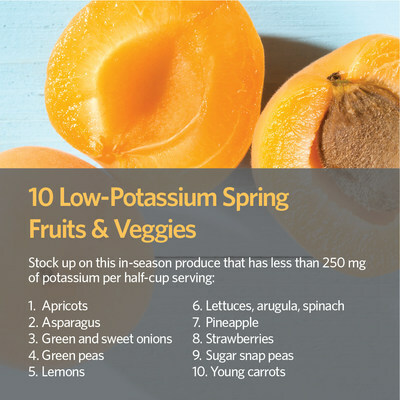 The "Springtime Favorites" cookbook includes information about low-potassium spring fruits and vegetables and tips on how to spring clean your kitchen. To download the "Today's Kidney Diet: Springtime Favorites" cookbook at no cost, visit DaVita.com/FreeCookbook. This includes our Today's Kidney Diet: Quick Reference Guide, which has information to help you choose the best foods for your stage of chronic kidney disease. This guide is not a substitute for professional medical or diet advice provided by your physician or dietitian. Those with kidney disease can take advantage of DaVita Diet Helper™ –– an easy-to-use meal planning tool that tracks phosphorus, potassium and sodium levels featuring more than 1,000 recipes that are kidney-and diabetes-friendly. DaVita Kidney Care is a division of DaVita Inc., a Fortune 500® company that, through its operating divisions, provides a variety of health care services to patient populations throughout the United States and abroad. A leading provider of dialysis services in the United States, DaVita Kidney Care treats patients with chronic kidney failure and end stage renal disease. DaVita Kidney Care strives to improve patients' quality of life by innovating clinical care, and by offering integrated treatment plans, personalized care teams and convenient health-management services. As of December 31, 2016, DaVita Kidney Care operated or provided administrative services at 2,350 outpatient dialysis centers located in the United States serving approximately 188,000 patients. The company also operated 154 outpatient dialysis centers located in 11 countries outside the United States. DaVita Kidney Care supports numerous programs dedicated to creating positive, sustainable change in communities around the world. The company's leadership development initiatives and social responsibility efforts have been recognized by Fortune, Modern Healthcare, Newsweek and WorldBlu. For more information, please visit DaVita.com. DaVita and DaVita Kidney Care are trademarks or registered trademarks of DaVita Inc.